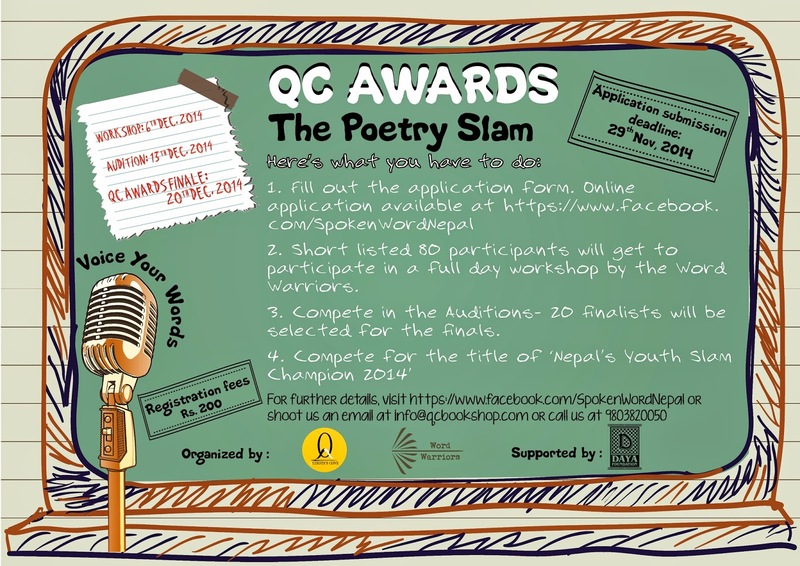 Bringing students closer to the art of poetry while inspiring and empowering them in the process, +Quixote's Cove and the +Word Warriors with support from Daya Foundation, came together for an interschool poetry slam QC Awards: The Poetry Slam 2014. +Anudeep Dewan shared +View Your Choice- तपाईको सोचाई हाम्रो रोजाई - about the motive, " Slam poetry being a performance based recital of original poetry we want the youth to interact with local slam poets and to join a network of young poets to spread the movement in Nepal. " The poetry can cover any topic and is judged based on the quality of the poem, expressiveness of the performer, audience response and performance style. It is a powerful form of creative expression, which gives youth an opportunity to present their unique voice. The contest will be bilingual giving students the option of working in a language they are most comfortable with. The contest is open for all participants between the ages of 14 to 23. All submissions will be reviewed by a panel composed of local writers, theatre actors and poets. The deadline for the submission of the application is November 29th, 2014. While, short listed 80 Applicants will participate in an intensive one day preparatory workshop to be held on December 6th, 2014. Designed to improve the participant’s written & editing poetry as well as hone their performance skills the workshop will be conducted by Nepal’s first slam poetry group, +Word Warriors Nepal. Short listed participants from the workshop will take part in an audition to secure one of the 20 places on December 13th, 2014 for their own original poetry and performance judged by Nepali poets, teachers and journalists. 20th December, 2014 will be a historic and memorable day for these finalist where Top Five Poets shall be selected by a panel of judges on two round competition.